Hanafuda (花札) are playing cards of Japanese origin that are used to play a number of games. The name literally translates as "flower cards." The name also refers to games played with those cards. In 1549, the 18th year of Tenbun, a missionary Francis Xavier landed in Japan and the crew of his ship had carried a set of 48 Portuguese Hombre playing cards from Europe, and eventually card games became popular, along with their use for gambling. When Japan subsequently closed off all contact with the Western world in 1633, foreign playing cards were banned. Despite that prohibition, gambling with cards remained highly popular. Private gambling during the Tokugawa Shogunate was illegal. Because playing with card games per se was not banned, new cards were created with different designs to avoid the restriction. For example, an anonymous game player designed a card game known as Unsun Karuta. These cards were decorated with Chinese art, each depicting Chinese warriors, weaponry, armor, and dragons. This deck consisted of 75 cards, and was not as popular as the Western card games had been, simply because of the difficulty of becoming familiar with the system. Each time gambling with a card deck of a particular design became too popular, the government banned those cards, which then prompted the creation of new ones. This cat and mouse game between the government and rebellious gamblers resulted in the creation of many differing designs. Through the rest of the Edo era through the Meiwa, Anei, and Tenmei eras (roughly 1765-1788), a game called Mekuri Karuta took the place of Unsun Karuta. Consisting of a 48-card deck divided into four sets of 12, it became wildly popular and was one of the most common forms of gambling during this time period. In fact, it became so commonly used for gambling that it was banned in 1791, during the Kansei Era. Over the next few decades, several new card games were developed and subsequently banned because they were used almost exclusively for gambling purposes. However, the government began to realize that some form of card games would always be played by the populace, and began to relax their laws against gambling. The eventual result of all this was a game called Hanafuda, which combined traditional Japanese games with Western-style playing cards. 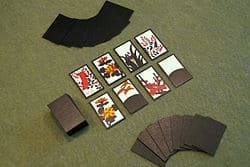 Because hanafuda cards do not have numbers (the main purpose is to associate images) and the long length to complete a game, it has a partially limited use for gambling. However, it is still possible to gamble by assigning points for completed image combinations. By this point, however, card games were not nearly as popular as they had been due to past governmental repression. In 1889, Fusajiro Yamauchi founded Nintendo Koppai for the purposes of producing and selling hand-crafted Hanafuda cards painted on mulberry tree bark. Though it took a while to catch on, soon the Yakuza began using Hanafuda cards in their gambling parlors, and card games became popular in Japan again. Today, despite its focus on video games, Nintendo still produces the cards, including a special edition Mario themed set for Club Nintendo. This is mostly in recognition of its own company history, rather than specifically for profit. In 2006, Nintendo published Clubhouse Games (42 All-Time Classics in the United Kingdom) for the Nintendo DS, which included the Hawaiian version of the game, Koi-Koi. Hanafuda is commonly played in the state of Hawaii in the United States and South Korea, though under different names. In Hawaii, there is Hawaiian-style Koi-Koi which is called Sakura, Higobana, and sometimes Hanafura. In South Korea, the cards are called Hwatu (Korean: 화투, Hanja: 花鬪); the name literally translates as battle of flowers. One of the most common Hwatu game is Go-stop (Korean: 고스톱) or Seotda (Korean: 섯다). Hwatu is very commonly played in South Korea during special holidays such as the Lunar New Years, and also during the Korean holiday of Chuseok (추석). Playing Go-stop at holiday family gatherings has been a Korean tradition for many years. The Korean version is usually played with three players, with two-person variants. Hanafuda is also played in Micronesia, where it is known under the same name, and is a four-person game, which is often paired cross-table. There are twelve suits, representing months. Each is designated by a flower, and each suit has four cards. Typically, each suit will have two normal cards and two special cards. The point values could be considered unnecessary and arbitrary, as the most popular games only concern themselves with certain combinations of taken cards. The Korean cards for Go-Stop, which uses a very similar deck of cards, has November and December swapped around. The January matsu Poetry Ribbon card has the phrase akayoroshi (あかよろし), employing a hentaigana character for the ka (可). The meaning of the phrase is currently unknown. Although, by breaking down the phrase into its component words (aka [あか] and yoroshi [よろし]), it roughly translates as "red acceptance paper." Moreover, the hentaigana ka (可) is formal and roughly means "acceptable/passable/good". The February ume Poetry Ribbon card has the same phrase akayoroshi. The March sakura Poetry Ribbon card has the phrase Miyoshino (みよしの) referring to the place Miyoshino (美吉野) in Nara. The town is known for its cherry blossoms. The September kiku Poetry card image has the character for kotobuki (寿). The November yanagi Rain card image portrays Ono no Michikaze. There are variations of games played with Hanafuda cards. The following rules are not official: there are many different games played with Hanafuda. Accumulate more points than the opponent. Either a set number of rounds is played, a point goal is set to determine the winner, or players try to get so many more points than their opponent. Cards are shuffled and placed into a pile (called the stock). Eight cards are placed face up between the players, and then eight cards are dealt face-down to each player. If there are more than two players, then the hand size is decreased. Play starts with the dealer and proceeds counterclockwise. The player takes a card that was dealt to them and matches suit with a card that is on the table. If there isn't a matching card, the player discards a card to the center of the table. Then, the top stock card is turned face up, and if there is a matching suit on the playing field, the player takes the cards, otherwise the stock card is added to the playing field. Play ends when either the stock is exhausted or either player's hand is empty. If a player is dealt four pairs or two complete suits, that player automatically wins the round. Scoring for this instance varies, but can be the value of the cards in the playing field. If there are a number of cards on the playing field of one suit, and a player has the rest of the suit in hand, this is a hiki. The player may take the entire suit of cards on their turn instead of playing a card from their hand. Trying to take a card from a hiki with the storm card is an illegal move. If the cards are dealt so that all four of one suit are on the playing field, the cards are shuffled and redealt. If three cards are on the table, they are stacked together and the remaining card takes all three. At the end of the round, each player adds the value of all cards they have taken. In some variations, 'winner takes all', meaning the winner of the match gets all the points the opponent has accumulated in that round. Card sets and scoring can vary by which variant of Hanafuda is being played. In case of a tie, dealer wins. If the dealer isn't involved with the tie, the player closest to the dealer's left wins.